Four SUNY New Paltz students have been selected to receive the State University of New York Chancellor’s Awards for Student Excellence. This honor is bestowed upon students who have distinguished themselves in academics, athletics, leadership, service and through other contributions to living and learning communities across the SUNY system. The following students were recognized at an April 5 ceremony in Albany, N.Y., attended by Chancellor Zimpher, President Donald P. Christian and Vice President for Student Affairs L. David Rooney, as well as several members of the New Paltz faculty and staff. Dani Ackerman ’16 (Communication Disorders): All-American and All-Conference field hockey student-athlete; two-year president of Student Athlete Advisory Committee. Jenisse Bouret ’16 (Journalism / Spanish): Chi Alpha Epsilon National Honor Society; WNPC-TV station manager, producer, and reporter; Resident Assistant; Student Ambassador; Cultural Diversity Advocate. Dylan Rose ’16 (Mathematics): Resident Assistant; Campus Event Recruitment Worker; mathematics tutor; founder and coordinator of peer mentoring initiative in the Honors Program. Sabrina Sarro ’16 (English – Creative Writing): Honors Program; senior staff member at Oasis/Haven; Resident Assistant; New Paltz Blogger; Transfer Liaison; participant in 2015 Santa Barbara Writers’ Conference; Scholars Mentorship Program. The Chancellor’s Awards for Student Excellence was created in 1997 to recognize students who have best demonstrated, and have been recognized for, the integration of academic excellence with accomplishments in the areas of leadership, athletics, community service, creative and performing arts, campus involvement, or career achievement. Each year, SUNY campus presidents establish selection committees to review the accomplishments of exemplary students. Nominees are then forwarded to the Chancellor’s Office for a second round of review. Finalists are then recommended to the Chancellor to become recipients of the award. Each recipient receives a framed certificate and medallion, which is traditionally worn at commencement. 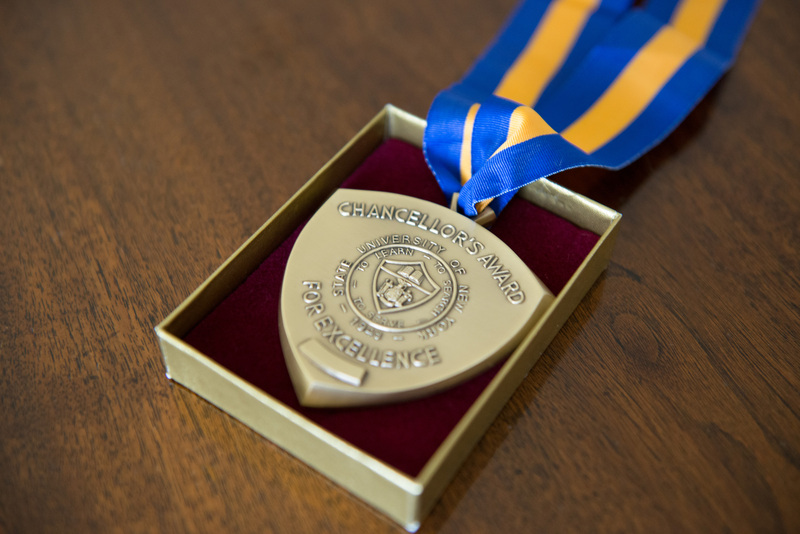 More information about the Chancellor’s Awards for Student Excellence is available online.